In this part, we’ll look at the configuration of conventional L2 acquisition programs. We’ll also delve into the direct-communicative approach, which is probably the most widely used foreign-language acquisition methodology in the world today. 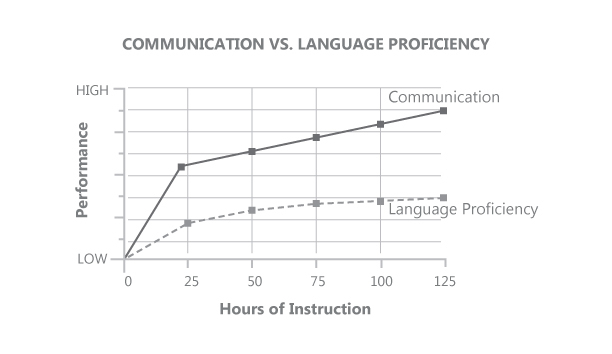 In most L2 acquisition programs, students are ranked as Beginners if they have little knowledge of the language. At this level, activities in class are often deliberately slowed down in part to offer a stress-free classroom environment and to facilitate the comprehension of fundamental grammar and commonly used words. The students, who naturally tend to emulate their mentors, infix the habit of also slowly handling the information they absorb. They get accustomed to practicing phonetic patterns that are quite different from the sounds of native-like speech. For that reason, many learners find themselves unable to recognize in fluent oral exchanges the very words they have learned. Thus undermining the students’ ability to produce and understand fluent speech from the beginning of the process of learning bears adverse and usually long lasting effects on the advancement of their integrated skills (i.e., speaking, listening, reading and writing). The same approach is used in the Intermediate phase. As in the previous level, the speech rate is reduced to facilitate the process of assimilating more complex grammatical structures and vocabulary. Even as they expand their knowledge, the students bolster sluggish communication habits and further distance themselves from the way native speakers use the language. At this point, the learners are often encouraged to get involved in wanton or topic-specific “conversations” for the sake of putting to the test their capacity to express themselves. They are told that the quickest way to improve their speaking and listening abilities is to practice what they’ve learned in free and easy chatter. That’s sweet music to the students’ ears, as most of them fall for the lure of effortlessly accomplishing great progress by participating in games and fun language exchanges. Making oneself understood—using any available means—is presented as the ultimate achievement. Why would anyone in their right mind want to toil for improved performance when, using the hassle-free communicative approach, functional communication can be attained with little or no effort? As for poor quality, no one should be so unwise as to agonize over their substandard output as marginal performance is sure to turn itself into proper handling of the language with only a little additional practice. How the transformation will happen, though, and how long the process will take are either well-kept secrets or anyone’s guess. That deceptive wait-and-see diversion is little else than a handy way to avert meaningful discussions regarding the learners’ language shortcomings and concurrent problem-solving actions. In fact, should the issue of students’ substandard language proficiency be acknowledged from an early point and any form of serious analysis on the subject be attempted, the truth would quickly become fully exposed. Lacking both a productivity-oriented outlook and effective performance-boosting techniques, most purveyors are not equipped with the proper tools to assist their students in (a) accomplishing through effective instructional techniques a swift conversion of knowledge into language proficiency (b) assertively probing into the causes of impaired performance, an often daunting task (c) planning and executing pertinent corrective actions (d) establishing personalized and reliable procedures of self-assessment (e) closely monitoring the evolution of their integrated skills, and (f) making the necessary adjustments. With their fine language project out of anyone’s control, it eventually dawns on the students that they are left to fend for themselves. Too disappointed to continue participating in communicative charades, many of them resolve to change the state of affairs by trying a different approach. However, it doesn’t take long for most learners to realize that true alternatives to the widespread communicative methodology are a rare commodity. At that point, frustrated by the poor results, lacking a personalized and dependable plan to boost their performance, with no solution in sight and no known valid options, they either desist or choose to carry on with the communicative scheme even though it is clear that this out-of-date methodology is leading them nowhere. By the time they get to an Advanced level, most learners have acquired a consistent knowledge of the target language, but they have also entrenched functional communication as the norm. Worst of all is the realization that they were never expressly warned against the dire and enduring consequences of habituating themselves to reckless handling of the language. They never received professional assistance to identify troublesome areas and follow through with adequate and timely counteracting measures. Then, they realize— often too late—that the most significant piece of advice they ever got was to… learn the way kids do! The more people become dependent on functional communication, the longer it’ll take them to achieve language proficiency. The most serious consequence of enforcing the communicative agenda on students is probably the fact that this approach tends to inhibit them from designing a personalized and detailed road map, beyond the dimension of rudimentary functional communication. It also prevents them from developing the capacity to make timely adjustments to secure accrued productivity. For that reason, those learners will lack the vision and the right sort of attitude to boost their performance in a structured, objective, and measurable way. * Question: Why do so many motivated and talented learners—both young and mature—study a foreign language for years and fail to achieve success? Answer: Because they are induced to regard communication as their goal, and the true goal is developing lasting skills, not simply communicating. Copyright © 2018 Guillermo Cook. This material may be saved, printed or downloaded for personal and educational (non-commercial) use. All other uses require written permission form the owner. Specific training procedures are required to secure greater language proficiency and confidence from the beginning of the process of learning. The Assertive Learning™ System helps individuals to not only break the habit of overusing functional communication but also to revise the below-standard phonetic structure they may have grown accustomed to. Adult learners who are prepared to do what it takes to achieve early language proficiency at the beginner level or, as is usually the case with more advanced students, to redress deep-rooted deviations—which often stem from inadequate training procedures—will quickly bring their language level up to par with the pace of oral exchanges among native speakers. This system of learning rests on the grounds of teaching experience and research in the field of foreign-language acquisition over a period of more than forty years in Europe and in the American continent. It has been successfully tested with children and adults in groups of up to thirty-five individuals, at all levels of language proficiency: Beginner, Intermediate, and Advanced. It is at present being used in primary and secondary school language programs, in private language schools and corporate training programs. The learners who are properly trained with the Assertive Learning™ System show a faster rate of improvement of their speaking/listening skills from the initial stages of the learning process, regardless of their age and background. To secure a higher level of performance from an early stage, the language information—what students learn—must be turned into efficient speaking, listening, reading, and writing. In the process of transformation of the language information—i.e., the conversion of knowledge into spontaneous and accurate output—the quantitative aspect (rote memorization of words and grammatical formulas) and flawed communication aren’t to be hailed as end results. The true goal is to develop superior language skills. The graph above is intended for clarity purposes only. In actual practice, actions relevant to each module merge into a single, coherent procedure as every new element of grammar/vocabulary enters the stream of information. Each one of the four modules poses special difficulties; each difficulty calls for specific solutions. 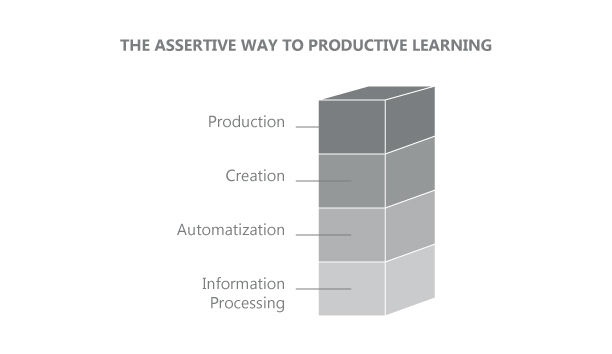 At every stage, the Assertive Learning™ System provides both students and teachers detailed guidelines to rapidly identify and overcome the obstacles that often hamper the process of conversion of information into efficient production. It has been said that all learning is simply conditioning, and that the conditioned response is the true unit of learning whenever a certain degree of automatization is required. With the Assertive Learning™ System, the participants take control of their own learning process by (a) assertively identifying their weak points with a positive, problem-solving attitude (b) designing a personal remedial strategy from an early stage and (c) becoming more creative and proactive.